“Geographies of the Liminal Dolphin: toward an understanding of the contested spaces of Dolphin-Assisted Therapy”. It has been published on the University of the Sunshine Coast, Queensland, Australia's Research Bank website, with a permanent link. Abstract: This research explored Dolphin-Assisted Therapies that have benefitted persons with disabilities and their families, yet have been widely contested in academic and popular media. The research found that knowledge and ethical judgments about the therapies vary according to the distance from which they are produced and that these therapies highlight mutualism between species, requiring a hybrid understanding of ethics. It produced the first social science study of the many types of therapy in the field using Geographic analysis of its discourse and a case study of a clinic in Curacao based on observations and interviews with families and therapists. For those who are not deeply interested in academic thesis development, and who want to read the parts about dolphins, therapy, and the research we did and our conclusions, we recommend reading Chapter One, then read Chapters Five thru Nine. We have had significant challenges in the development of this research. 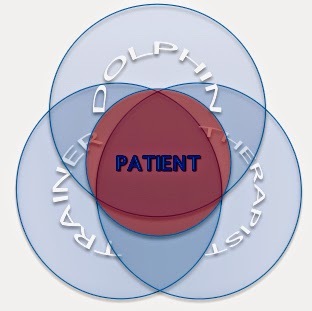 The first was constructing a definition of Dolphin-Assisted Therapy (DAT). Our research has developed an understanding of DAT's many varieties, highlighting 13 different types. The next challenge was to assemble a history of DAT. No truly comprehensive history of DAT existed. We visited and interviewed key persons in its history, did extensive research in original documents and were able to construct a history that should serve to make clear the key moments, ideas, and persons who have played important roles. Every published paper on DAT that we could locate was analysed, including papers in Spanish, Greek, Russian, Finnish, German, and English. Some were doctoral theses, some were journal articles, some were seemingly academic but published in non-peer-reviewed sources. We analysed the research of academics who oppose DAT and discovered significant flaws. We did not find opposition based on open-minded and balanced research, but found influential papers written with strongly preconceived biases. Analysis of the 'gray literature' in the DAT discourse, that is, texts that are in the public domain that draw upon science but have not been peer-reviewed, also found a lack of rigorous scientific standards. There we found clear statements made by academics demonstrating bias. What became clear is that studies that conclude that DAT has no validity do provide incentive to do better research. Critical analysis has pointed out various flaws and ways the research can be improved. Research supportive of DAT was analysed. In doing so, a definition of DAT was developed that includes its many varieties. Some notions of what DAT is were found to not be based on evidence that was available to scientific analysis. While this poses problems for academic understanding it does bring some people to try DAT, drawn by the hopeful descriptions of non-scientific supporters. Some supportive research was well done, revealing significant positive outcomes for many families. What was especially important to discover was the lack of field research by those who oppose DAT. We found no significant published research critical of DAT that was based on interviews, visits to facilities, or analysis of medical records. Instead, we found a prevailing concern with the complex ethics of human-nonhuman relations as the primary driver of opposition to this field of therapies. There were few attempts to challenge the actual therapy itself, and these were found to have been done by academics without credentials or documented training for such analysis. A significant finding in our research was the benefit to dolphins from being involved in DAT. For those dolphins who live in human care and found to be at ease in human presence and who demonstrate a willingness and enthusiasm for working alongside trainers and therapists, a life apart from the ocean and in daily contact with humans seems to provide important enrichment and social interaction. 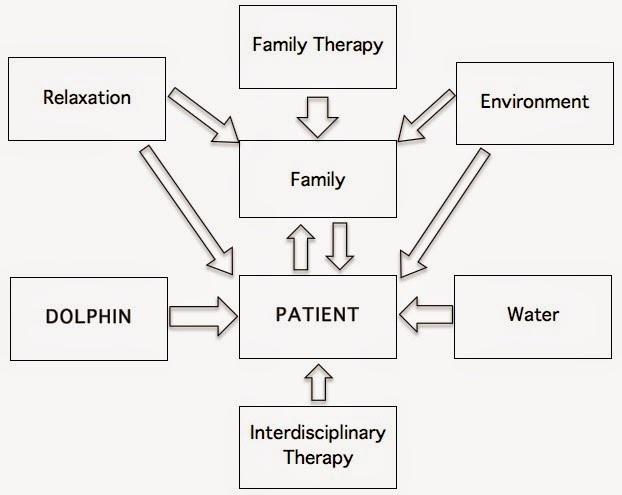 Therapists refer to the dolphins with whom they work in therapy sessions as their ‘colleagues’, a unique description for a non-human animal. Among the other findings were that DAT is holistic, reaching far beyond the interactions in the spaces of dolphin enclosure. Families experienced DAT from the first determination to utilise it. Its effects are felt when their lives become focused on travel, fundraising, family adjustments, and community involvement. Several of the interviewed families described how their local community rallied in support of them, doing fundraising events and becoming much more engaged and supportive of them. DAT also reaches into the lives of providers, the therapists and dolphin trainers, causing global movement, relationship changes, career advancement, and improved lives for the therapists and trainers. As we searched for concepts that support our findings we found the work of an early Geographer, Peter Kropotkin, who published a book in 1902 on his research that demonstrated cooperation as a significant part of relationships in nature. Kropotkin developed this theory to counter the notion put forward by Darwin and Huxley that competition was the fundamental basis of all relationships in nature. Calling it ‘Mutual Aid’, Kropotkin’s book still influences many areas of biology. Referred to as ‘mutualism’, the concept has now taken on the meaning of relationships that go beyond symbiosis into mutual benefit based on cooperation. This describes the interspecies work going on in DAT and we used mutualism as an important concept to describe its cross-border work. Other important work by Donna Haraway, Vicki Hearne, Bruno Latour, Nigel Thrift, William S. Lynn, J. Claude Evans, and Michel Foucault were influential in our work. Among those whose work on DAT has been of special importance to our research are David Cole, Dr. Steve Birch, Dr. David Nathanson, Marco Kuereschner, and Kirsten Kuhnert. We extend our heartfelt thanks to the Curacao Dolphin Therapy Center for their wonderful support of our research, and especially to the families who were willing to be interviewed, and the dedicated therapists and trainers who took time to share so much with us. This is the first research ever published on the social dimensions of DAT, the spaces it creates, and the affective realities in which it exists. As a contribution to the body of literature on DAT, it will serve as a milestone. We are very pleased to make it available to anyone who cares to study it.